TapHappy Tiles is a game that challenges your mental response time. Beat your own high score as you tap your way through time! To play, simply choose one of the difficulty levels and start tapping the flashing tiles. Don't worry if you can't get around to tapping all the flashing tiles. You will loose 100 points and a life only if you tap tiles that are not flashing. 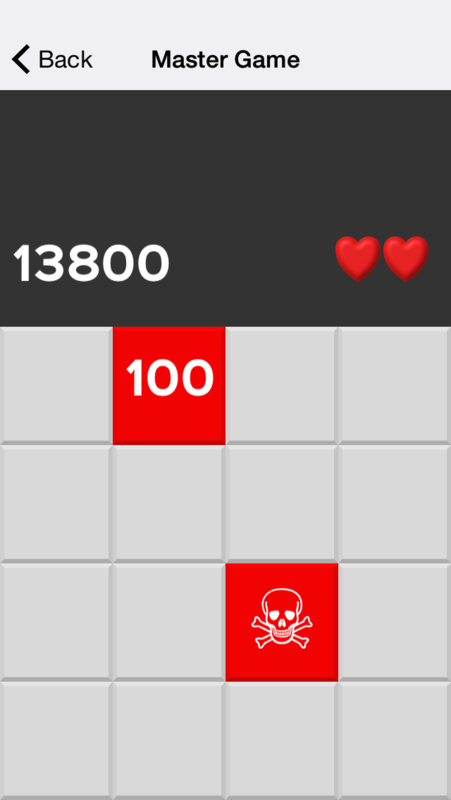 The number of lives you have is indicated in the top right of the game screen. TapHappy Tiles is a game that challenges your mental response time. Beat your own high score as you tap your way through time. To play, simply choose one of the difficulty levels and start tapping the flashing tiles. 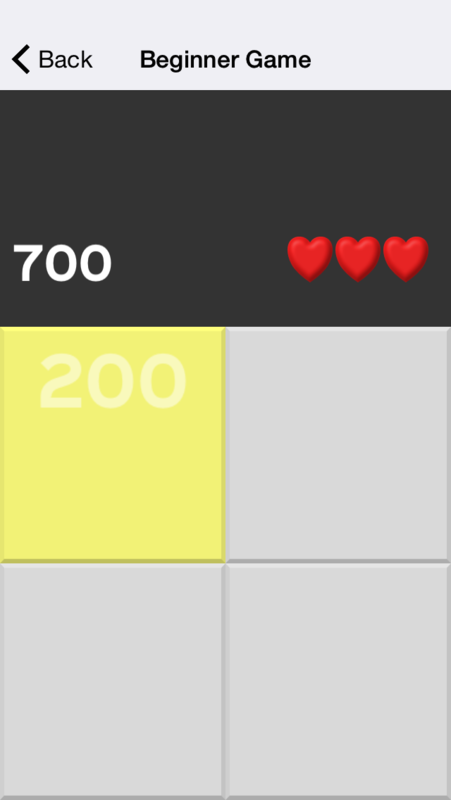 Don't tap tiles that are not flashing, or you will loose 100 points and a life. The number of lives you have is indicated in the top right of the game screen. Also, don't worry if you can't get around to tapping a flashing tile. It won't cost you anything. In fact, avoiding the tiles may give you a second of rest! To select a difficulty, simply tap Beginner, Intermediate, or Master to begin a game at that level. A 2x2 grid that starts relatively slowly. Really simple--to give you an idea of how to play. This 3x3 grid really starts getting into the game. Faster than the Beginner grid, the intermediate will increase the number of tiles that flash at a time. 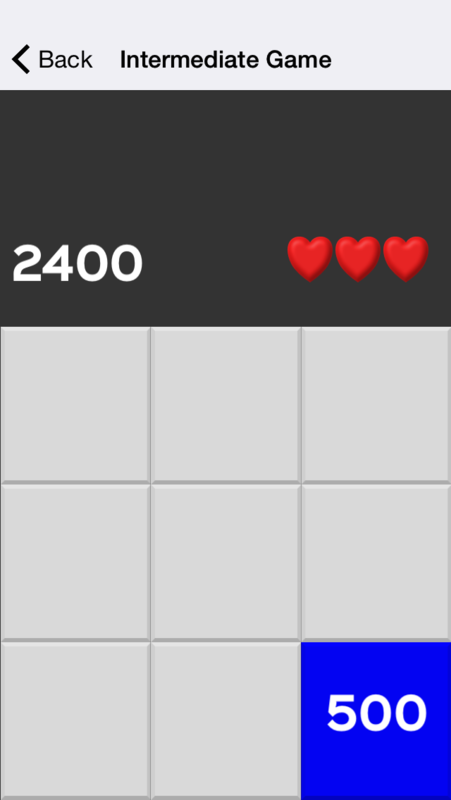 With the 4x4 grid, you will have to pay careful attention to the tile you are tapping. 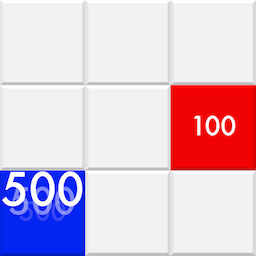 The speed is much faster and will increase as you play It starts with two tiles flashing. To select a ColorSet, which adjusts both the menu and the colors of the tiles, just choose one of the segments in the Themes section under Settings.